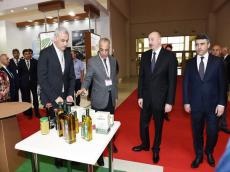 President of Azerbaijan Ilham Aliyev has viewed WorldFood Azerbaijan 2018, the 24th Azerbaijan International Food Industry Exhibition, and Caspian Agro 2018, the 12th Azerbaijan International Agriculture Exhibition, in Baku. Azerbaijan’s Minister of Agriculture Inam Karimov informed the head of state about the exhibitions. President Ilham Aliyev viewed the stands of the exhibitions.